This survey conducted by SHRM (Society for Human Resource Management) examined organizational commitment to diversity and inclusion. The survey explored who is responsible for implementing and leading diversity initiatives in the workplace, examined how diversity training budgets are faring in these uncertain times, looked at sexual orientation discrimination and gender identity policies,and other related topics. Excerpt: Survey Findings . . .
diversity initiatives in the workplace? augment their organization’s business efforts. orientation discrimination in the workplace. Congratulations to Kevin L. Bell, Senior Manager – Diversity Supplier Development, Chrysler Group LLC for being named “National Advocate of the Year” by the Michigan Minority Supplier Development Council (MMSDC) for his leadership in promoting the growth of minority supplier spending and business development at the Company. We salute your efforts and are proud to partner with you and Chrysler's Diversity Supplier Development Dept. 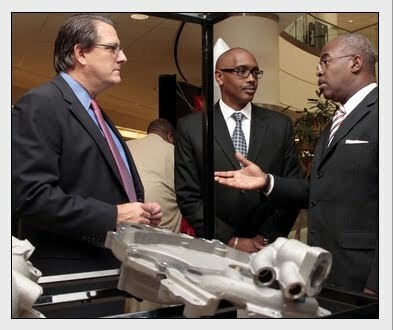 G. Jerome Harvey, President and CEO, Harvey Industries with Sig Huber, Director – Supplier Relations and Kevin Bell, Senior Manager – Diversity Supplier Development, Chrysler Group LLC at Chrysler Group’s 12th Annual Matchmaker event. Since Chrysler first launched the Matchmaker event in 1999, it has become a premier networking event in the automotive supplier diversity community. This year's event grew to more than 2,000 participants, including 270 minority-owned, women-owned, veteran-owned and majority-owned Chrysler Group suppliers. ". . . in addition to the innovation small suppliers can provide, [a] real reason to invest in supplier diversity: building programs that stick over the long-term." A look at Walmart's journey in Supplier Diversity, in this case specifically working with woman-owned businesses. DIR hopes they have our National Minority and Women-Owned Business Directory to reference! Just discovered these great, annual posters from Western Washington University. You can order past posters ... so I wanted to share. Enjoy! "Many prejudices are unconscious, and exclusions are often unintentional. Only through challenging our own preconceived notions about diversity can we build a productive and collaborative work environment in which all people thrive." The above quote is part of the description for a new (pub date August 2011) book by Howard J. Ross: ReInventing Diversity: Transforming Organizational Community to Strengthen People, Purpose, and Performance. Howard J. Ross is Founder and Chief Learning Officer of Cook Ross Inc. He is one of the nation’s leading diversity training consultants and nationally recognized expert on diversity, leadership, and organizational change. Have you read it? Do you have some opinions on it? Please share. I'm anxious to check it out. DiversityBusiness.com . . . will be conducting its 12th annual "Top Businesses in America" survey. The research allows entrepreneurs to be identified and honored for their business achievements on a national and regional basis.
. . . An opportunity to have your business listed by the world's most preeminent publications including Forbes Magazine, Business Week and thousands of media outlets throughout the world. Honorees will be recognized and honored at the 12th Annual Multicultural Business Conference in April of 2012. This year's survey will determine the Top 500 businesses in the United States and the Top 100 businesses in each State in the following categories:, Privately-Held Businesses, Women Owned Businesses, Small Businesses, Veteran and Diversity Owned. More at DiversityBusiness.com. "When we draw on the wisdom of a workforce that reflects the population we serve, we are better able to understand and meet the needs of our customers-the American people. Government-wide, we have made important progress toward hiring a workforce that truly reflects America's diversity, and we will continue to pursue that goal. But merely hiring a diverse workforce is not enough. We must make our workplaces more inclusive as well. America was founded on the ideal that from many, we are one, a whole that is greater than the sum of its parts. That is the rationale for inclusion. To gain the maximum benefit from our increasingly diverse workforce, we must make every employee feel welcome and motivated to work their hardest and rise through the ranks. We must affirm that we work better together because of our differences, not despite them." Steps in the right direction. Wanting to be more a-twitter with small business ideas? ...The true value of Twitter is that it can help you learn at warp speed about how to build, grow and develop a business, and you get to learn from some of the smartest minds on these subjects. Where in the world . . . Welcome to a new approach to learning, networking, and marketing your small business! On August 15-18th, 2011 in New Orleans, LA, the Department of Veterans Affairs, in partnership with the Veteran Federal Interagency Council, is hosting the largest nationwide conference of its kind in support of Veteran-Owned, and Service-Disabled Veteran-Owned Small Businesses. Attendees will be able to connect with program managers and procurement decision makers from the VA and other federal agencies, learn about future requirements, expand business knowledge and contracting opportunities, and use the VetGovPartner Business Network platform to network with potential corporate and government partners. Participants will choose from more than 200 sessions designed to educate both new and established businesses, and to connect them directly to government procurement decision makers. Congratulations to Juventino Cano, CEO of Cano Container Corporation and Commander Packaging West for the cover feature on MBE Magazine. We're pleased to have your service listed in DIR's Supplier Database! We particularly like his philosophy of paying attention to his clients: "I try to see my clients at least quarterly, for if you don't visit, someone else will." Truth! Are U.S. Corporations Flirting With Economic Suicide by Not Supporting and Helping to Develop Minority-Owned Businesses? This article highlights points recently published in "Minority Business Success: Refocusing on the American Dream" coauthored by James H. Lowry and Leonard Greenhalgh. What DIR appreciates about the recap is its focus on corporate + small business relationship building. It behooves corporations to cultivate strong, trusting relationships early-on with small, diverse businesses in order to be positioned to be good counsel and eventually competitive receivers of needed goods and services. Business building is a two-way street, and as we know, respecting the "rules of the road" is necessary but trusting your fellow drivers is vital–or no one survives without some accidental bumps and scrapes. "U.S. companies need to do a better job of supporting and developing minority businesses. Minorities will become the majority of the U.S. population by 2045. Therefore, minority businesses need to deliver the value that American corporations expect -- at every level of the supply chain. Right now they do not -- as they are relegated to low-value or peripheral work that does not directly support the corporate value chain," said BCG Senior Advisor James H. Lowry, coauthor of Minority Business Success: Refocusing on the American Dream (Stanford Business Books, 2011). As the Space Program, as we know it from NASA, comes to a close, DIR salutes the various American "firsts" who have flown "to infinity and beyond" and led the way for diversity in the program! Sally Kristen Ride was born on May 26, 1951 in Encino, California (near Los Angeles). At 27, with B.A., B.S., and masters' degrees, she was a Ph.D. candidate looking for postdoctoral work in astrophysics when she read about NASA's call for astronauts in the Stanford University paper. More than 8,000 men and women applied to the space program that year. 35 were accepted, six of whom were women. In 1983, Dr. Sally Ride became the first American woman in space on the shuttle Challenger (STS-7). Her cumulative hours of space flight are more than 343. Guion Bluford earned a master of science degree with distinction in aerospace engineering from the Air Force Institute of Technology followed by a doctor of philosophy in aerospace engineering with a minor in laser physics from the Air Force Institute of Technology. In 1978, he learned he was the 35 astronaut candidates selected from a field of over 10,000. Guion Bluford entered the Astronaut Training Program, and became an astronaut in August 1979. Guy's first mission was STS-8 aboard the space shuttle Challenger, which launched from Kennedy Space Center on Aug. 30, 1983. This was Challenger’s third flight but the first mission with a night launch and night landing. It also marked the occasion of the first African-American astronaut, Guy Bluford. (The first black man in outer space had been Cuban Col. Arnaldo Tamayo-Mendez on the Soviet mission Salyut 6 in 1980.) After 98 orbits of the earth, the Challenger landed at Edwards Air Force Base, Calif., on Sept. 5, 1983. Selected by NASA in January 1990, Dr. Ochoa became an astronaut in July 1991. Her technical assignments in the Astronaut Office include serving as the crew representative for flight software, computer hardware and robotics, Assistant for Space Station to the Chief of the Astronaut Office, lead spacecraft communicator (CAPCOM) in Mission Control, Acting Deputy Chief of the Astronaut Office, Deputy Director of Flight Crew Operations, and Director, Flight Crew Operations, where she managed and directed the Astronaut Office and Aircraft Operations.. A veteran of four space flights, Dr. Ochoa has logged over 978 hours in space. Dr. Ochoa currently serves as Deputy Director, Johnson Space Center. Chang-Diaz, a Costa Rican-American engineer, physicist, was selected as an astronaut candidate by NASA in 1980 and first flew aboard STS-61-C in 1986. He is currently president and CEO ofAd Astra Rocket Company. He is a veteran of seven Space Shuttle missions, making him the record holder as of 2008 for the most spaceflights (a record he shares with Jerry L. Ross). He is the first naturalized US citizen to become an astronaut. Dr. Jemison was the science mission specialist on STS-47 Spacelab-J (September 12-20, 1992). STS-47 was a cooperative mission between the United States and Japan. The eight-day mission was accomplished in 127 orbits of the Earth, and included 44 Japanese and U.S. life science and materials processing experiments. Dr. Mae Jemison was a co-investigator on the bone cell research experiment flown on the mission. The Endeavour and her crew launched from and returned to the Kennedy Space Center in Florida. In completing her first space flight, Dr. Mae Jemison logged 190 hours, 30 minutes, 23 seconds in space, making her the first African-American woman in space. John Glenn, a three-war veteran, became the 3rd American in space and the 1st to orbit the earth on February 20, 1962. Glenn resigned from NASA on January 30, 1964, and retired from the Marine Corps on December 31, 1964. John Glenn served as a United States Senator from Ohio from 1974 to 1999, and became the oldest person to go into space when he flew aboard the Space Shuttle Discovery during Mission STS-95 from October 29 to November 7, 1998. Herrington made history as the first native American in space. U.S. Navy Commander Herrington flew from NASA's Kennedy Space Center with six other astronauts to the International Space Station. It was the 16th American assembly flight to the space station. To honor his Native American heritage, Herrington, a registered Chickasaw, carried a Chickasaw Nation flag on his eleven-day trip. The flag had been presented to him by Chickasaw Nation Governor Bill Anoatubby. Herrington's maternal great-grandmother was of Chickasaw descent. Students and elders from the Chickasaw Nation witnessed the launch at Cape Canaveral, Florida. Supplier Diversity Manager at W.W. Grainger, Inc.
July 20 Deadline ... Register Now! July 20, 2011 is the Early Bird Discount Deadline. Register *today* for our August "Best Practices" seminar! 16th Annual Best Practices in Supplier Diversity Strategies and Initiatives ... coming soon! NOTE: Earlybird registration ends soon! Register now at Diversity Information Resources to take advantage of the special rate. * SBA Updates: WOSB Program, SDB Self Certification, etc. Sign Up for Diversity411 Emails! Click here to sign up for breaking news and information from DIR, the leader in supplier diversity information since 1968. For more information . . .
About DIR's rich history in supplier diversity . . . Follow DIR's Diversity 411 Blog by Email! All content copyright Diversity Information Resources. Simple theme. Powered by Blogger.